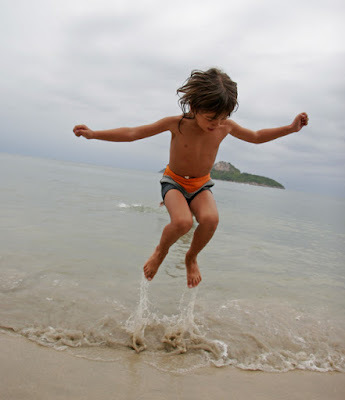 I apologise for having no updates for nearly 2 weeks on the Phuket weather blog. Sometimes real life is quite busy, so the virtual blogging, facebooking world has to take a back seat. Last update was 4th October - we were having a lovely sunny weekend... but then it all went wet again. I did update a few weather notices on Twitter - you can follow me on Twitter... https://twitter.com/jamiemonk. The wind and rain returned for several days from 5th October meaning a few cancelled dive trips, though I think our cancelled customers were quite relieved that the decision has been made for them. Yep, it was really wet for a few days and the wind forecasts were showing possible 12 foot waves at the Similan Islands. From 8th - 15th October I had a little holiday. Just a week to relax before high season arrives and the dive shop (hopefully) overflows with customers! We drove from Phuket to Chumphon on the 8th, about 400km or halfway to Bangkok. 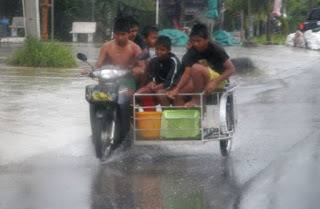 Was very wet when we left and rain was very heavy in Phang Nga, lots of big pools of water on the roads. Not a great day for driving. Was slightly better on the Gulf of Thailand side, though the drizzle kept up most of the way from Surat Thani to Chumphon. A couple photos below snapped from car window. 11th - we were at Ao Manao in the morning, a very popular beach for locals in the Prachuap area, also attracting visitors from Bangkok. Rather a grey morning for the beach and the afternoon was rainy. On the 12th, we visited Khao Sam Roy Yot national park, lots of mountains and caves in the area. 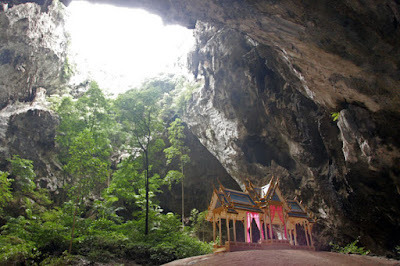 We headed for Tham Phraya Nakhon, which is a famous cave that has been visited by several Kings of Thailand and is the symbol of Prachuap Khiri Khan province. We drove back home to Phuket on the 14th, a lovely sunny day except for some rain around Phang Nga again. Looks like the weather is heading to high season now. 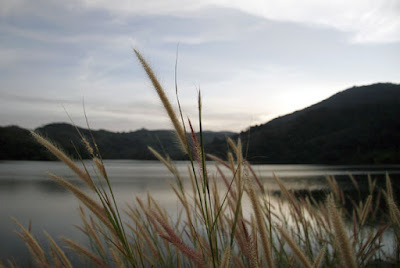 On the 15th, a relaxing day at home, took the kids for ice cream and a walk at Bang Wad reservoir in the evening. The reservoir was looking nice and full.. hardly surprising, it's not been the driest of low seasons! Friday and Saturday were both warm sunny days. 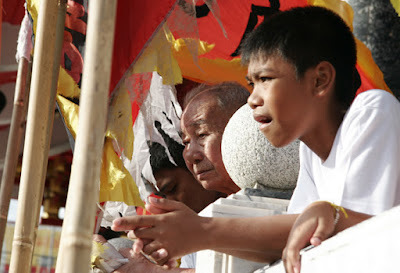 Saturday evening was the start of the Phuket vegetarian festival, which I like to blog a lot! 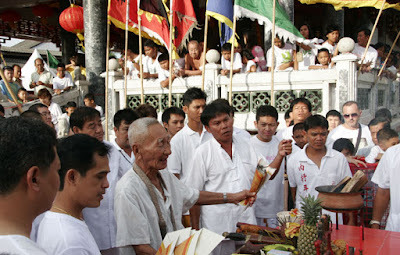 There will be photos of processions on the Phuket blog over the coming 2 weeks. Saturday was the "Pole Raising" ceremony where a 20 meter high pole is hoisted up to the skies at all participating shrines. The gods are said to descend the poles into the shrines. I took a few photos, but my poor camera decided to give me Error 99 just as the pole raising started. Sunday - that's today - started wet, got drier, and the afternoon is nice and sunny. High season is just about here. 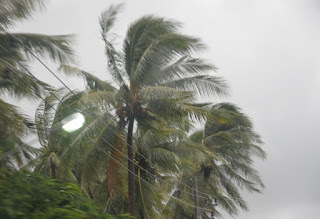 No more strong winds I think, but we do get rain and thunderstorms at the start of high season - nothing to spoil a holiday, but even in Phuket the sun does not shine 24 hours per day.